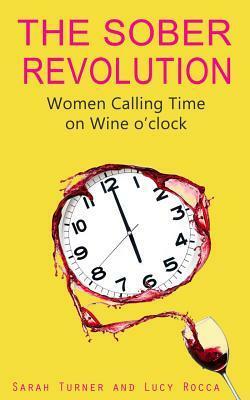 The other day, I found myself recommending The Sober Revolution: Women Calling Time on Wine O’Clock in glowing terms over at Living Sober – and if you haven’t checked out Mrs D’s new venture, go and do so, because she’s doing an amazing job of curating a friendly, non-threatening new sober community. So I thought I should sit down and write a proper review of it. Put very simply, this book is the reason why I’m sober. I read it on the evening of my last ever drink. I hadn’t quite screwed up my courage to quit, at that point; I knew I should, which is why I was reading it, but I didn’t really believe that I’d be able to. So I accepted the gin and tonic that Lovely Husband had poured me, and sipped it while I read. I was only halfway through the drink when I realised that I was going to quit, and although I finished it, it was the last alcohol that passed my lips. Lucy Rocca is the founder of Soberistas, which she began to help others after ceasing her own drinking in April 2011. At her worst, she was drinking 150 units a week: roughly twenty bottles of wine. Sarah Turner is a cognitive therapist specialising in addiction, also with a background of her own alcohol abuse, who went on to found the Harrogate Sanctuary from which most of the case studies are drawn. The combination means that this book combines the experience of an alcoholic with the knowledge and training of a specialist in the field, the lack of which is my problem with a lot of self help alcohol books. Sober Revolution spoke to me in a way that no other alcohol self-help book ever has, and when I re-read it yesterday I kept pulling out quote after quote that seemed to encapsulate everything I want to say about it. This is partly because Rocca and Turner are writing to women. They talk about wine rather than alcohol, employ the analogy that wine, for a problem drinker, is like ‘Mr Unsuitable’ the emotionally abusive boyfriend, and fill the second half of the book with case studies of female drinkers. Rocca references the idea that ‘Mummy’s wine o’clock’ marks the point where a day attending to the needs of children shifts into a relaxed adult evening, and that the wine is a powerful prop in this shift. This book is explicitly aimed at female drinkers, and its aim is true. The first part of the book, written by Rocca, addresses the common fears that people express when they’re considering sobriety. What if my spouse isn’t supportive, how will I enjoy myself at parties, what will I drink instead? It focuses on the way that alcohol makes us feel rather than the quantities; Rocca is pretty explicit in saying that if you feel anxious about how much you drink, then chances are that moderation has already failed for you and sobriety is the answer. And it does something that many other books on the topic don’t do: it acknowledges that sometimes, drinking can be wonderful. That even if things have gone beyond the point of no return, sometimes you have a lovely night, cosy with your partner or laughing with friends, and wine is there with you. But as she says, occasional good nights are no reason to stick with something that’s causing so much damage. It’s the abusive boyfriend analogy again: no matter how lovely and caring he is today, how romantic his gestures…if you stay with him, he will eventually hit you. The section that deals with moderation, or the idea of an occasional drink, really encapsulates Rocca’s message. Unsurprisingly, she’s not an advocate. But it’s why she’s not an advocate that I find powerful. A lot of addiction literature refers to an immediate loss of control; one glass will turn into a bottle, which will turn into a black-out. That’s never been the case for me, and I always find those arguments uncompelling. This idea that addiction is entirely about ‘not having an off switch’ and the alcoholic drinking until they pass out or all the drink is gone, is so reductive that it is part of what kept me drinking. I didn’t drink like that, and so, according to some views, I wasn’t an alcoholic. Rocca, instead, focuses on the reasons why getting sober is such an amazing experience, and why attempting moderation (if you’re a problem drinker; she certainly isn’t claiming that nobody should drink) will negate all of those good things. She focuses on the fact that when you stop drinking, you regain your self-esteem. Drinkers have low self-esteem, in part because the fact that we try, and fail, to moderate ebbs away our self-pride, and also because the effect of alcohol on the central nervous system causes anxiety and depression. Here’s Rocca: ‘For twenty years I had repeatedly piled on the negative, the stupid, the irresponsible, the terrible and the majorly regrettable incidents to my already fragile levels of self-confidence and the result was a weak person who would crumble at the slightest sign of a problem’. (As an aside, I read that, and thought: Well, but I have pretty good self-esteem actually. I mean I hate that I drink, but I’m an alright person. I’ve accepted that I’m never going to be talented or famous or successful, and I’m not beautiful and a bit fat, and my job is go-nowhere because I couldn’t make it as a lawyer. But I’m okay with that. Honestly. ) So, she posits, you need a good period of time completely free from alcohol to enable your self-esteem to come back. ‘The truth is”, she says “whilst ever you continue to drink alcohol on a regular basis, you won’t know who you really are or what your full potential is”. And she’s talking about sobriety as a journey of self-discovery, which, it turns out, it is. You need to silence the voice of alcohol to hear your own voice again. Rocca is so positive about the ways in which sobriety can be transformative that I found myself disbelieving her by around Chapter Eight. You’ll gain hobbies, she says, and new friends. You’ll awaken a creative spark, take a leap in your career, look better and feel happier every day. Right, I thought. Whatever. I’m failing to do all of those things not because of the wine, but because I have small children, ADHD, any number of other excuses. “Over time”, says Rocca, “it will become glaringly obvious that the only reason you felt like you were treading water for all these years was because you spent them drinking too much”. And you know what? She’s right. She’s right! The second half takes case studies of women, some from the Harrogate Sanctuary and some from elsewhere, and talks about their drinking and their moment of realisation. Some were heavier drinkers than others, but all of them were able to overcome their problem. The one that shocked me the most was the tale of Ruth, a highly functional career woman whose drinking was controlled to the point where she never blacked out, embarrassed herself or drove drunk. Except that she did: one morning, after a night where she’d drunk heavily but ceased around 8pm, she was rear-ended in a car accident that was entirely the fault of the other driver. A policeman attended the scene, breathalysed both parties, and found that she was two and a half times over the limit. She had been driving drunk, on the residual effects of the night before, probably for years. And so had I, in that case, and that blew another perception of mine out of the water. Sober Revolution is a very thorough book. It addresses different forms of problematic drinking, their causes and effects. But throughout the book, the message that comes through loud and clear is one of hope. Give up alcohol, and gain the world. Become who you were supposed to become. You can transform yourself; you’re worth it. If you’re reading this, and you’re worried about your drinking, read Sober Revolution. It might change your life. It changed mine. Allie – I too loved this book. I read it about 2 weeks in and will return to it again and again. Of course – it was your blog post “A Room of My Own” that “got me sober”. Although a few months before then I had started reading some sober lit and was getting less and less able to ignore the voice that told me my drinking WAS a problem – on that particular Tuesday (the 10th of June) I wasn’t consciously thinking about it. But, someone I know from Mumsnet just happened to post a link to your blog and that popped up on my Facebook feed. That post – and your blog in general – just hit the spot at the right time – and lead to all the other resources that have helped me get this far. I suddenly realised that a life without alcohol WAS possible. And so of course – because The Sober Revolution was what decided it for you – I also have Sarah Turner and Lucy Rocca to thank too! The chain of events of all of the women out there working towards freeing themselves – and ultimately others, from alcohol really is something special. Sisterhood in its truest terms! think that this book is the one that showed me most clearly two things: firstly that I AM NOT ALONE and secondly that change IS possible. it’s a great book, absolutely! very thorough review, Allie! I downloaded from Amazon to my kindle and have hardly been able to put it down. Like Mrs D…is going without, The Sober Revolution is great reading.